Heat oil in a pan, add ginger ,garlic & saute few mins. Add the heart(white part)of the spring onion & sauté. Add green part of spring onion & sauté. Mix in the cooked rice & soy sauce. Mix well & garnish with green part of the spring onion . delicious and yummy fried rice! Love love rice like this. Simple, easy but so so delicous. I'll love this any time. Fried rice is always my favourite. Thats a delicious fried rice, prefect for lunch box..
Tasty rice and simple recipe. Perfect clicks. Simply to prepare and absolutely delicious!!!! This is one of my favourite kinds of fried rice! So simple to make and looks so yummy! I love spring onions, yummy! 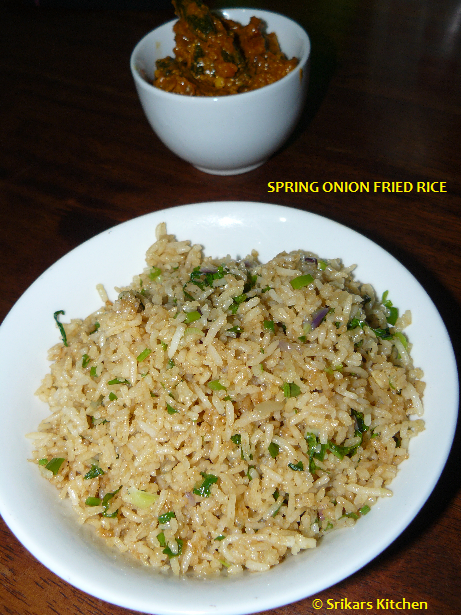 Love this spring onion fried rice! Nice recipe..